Traditional density columns layer immiscible liquids (ones that won’t mix), such as oil and water. One advantage of this type of density column is that you can shake the container and the liquids will separate. One disadvantage to using immiscible liquids is that you quickly run out of either readily available or non-toxic chemicals to layer. However, you can make a completely non-toxic density column, using as many layers as you want, by changing the concentration of a safe soluble chemical in water. For example, this project makes a rainbow density column using colored sugar and water. It’s really easy to do, can be made in any combination of colors, and lasts virtually forever. (I say virtually because eventually you’ll get crystals in the column, but it’s good for a couple of months at least). First, plan your colors. You will make a separate sugar solution for each layer. A rainbow is nice because it doesn’t matter if the colors bleed into each other a little where the layers meet. Make the solutions. The bottom layer has the most sugar, with less sugar in each of the layers above it. The top layer can be pure water, if you like. I made the bottom solution with 5 tablespoons of sugar and 3 tablespoons of water; next layer was 4 tablespoons sugar and 3 tablespoons of water; next layer was 3 tablespoons of sugar and 3 tablespoons of water; next layer was 2 tablespoons of sugar and 3 tablespoons of water; top layer was 1 tablespoon of sugar and 3 tablespoons of water. You may need to heat the solutions to get the sugar to dissolve. I have best luck using boiling water, at least for the most concentrated solutions, but if you have young helpers, you might want to stick with hot tap water. The amounts of sugar and water are not critical, so long as the lowest layer has the most sugar and each layer above it has less sugar. Add a drop or two of food coloring to each container. I used purple, blue, green, yellow, red. If you look at the picture, you can see the most blending between colors occurs at the top of the container, where the solutions aren’t as concentrated. Do not go crazy with the food coloring or you won’t be able to see through the liquids and you’ll miss the colors! If you used boiling water, let the solutions cool a bit before layering them. You don’t want to get burned. Now layer the liquids. Start with the solution with the most sugar. Pour it into your container. You may not need to add all of the liquid, depending on the size of your display container. Layer the next solution on top of it. You want to disturb the lower layer as little as possible, so you can slowly pour the liquid down the side of your container, pour the liquid over the back of a spoon, or use a straw to pick up liquid and dispense it on top of the next layer. Continue adding layers until you reach the top. 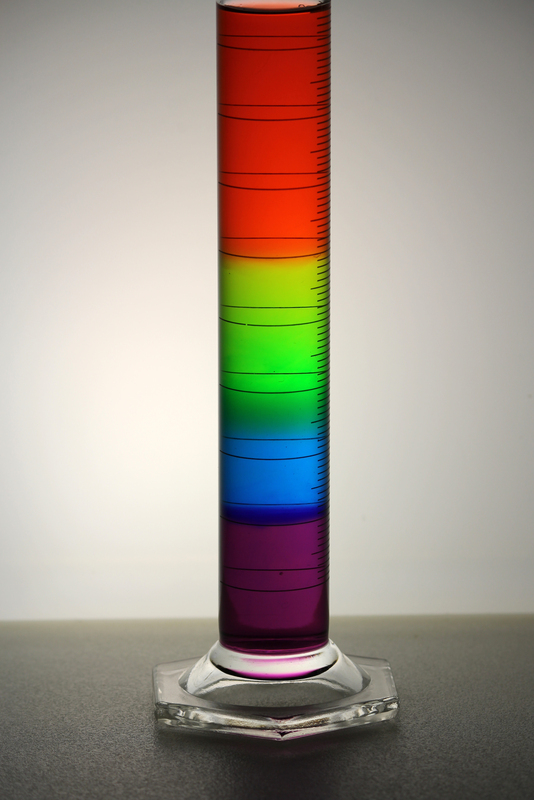 You can use the rainbow density project as a decoration or to teach principles of density, concentration, and color theory. I have not had trouble with the column attracting ants, but it will draw dust, so you may wish to cover it. Avoid disturbing it, to prevent the colors from mixing. When you clean out the container, use hot water to dissolve any sugar that may get stuck inside. Tip: If you want to drink the density column, you can, but it will taste a lot better if you use powdered drink mixes. You can use sweetened powdered drink mix (if it contains sugar) instead of the sugar and food coloring. If you have unsweetened drink mix, use it in place of the food coloring.